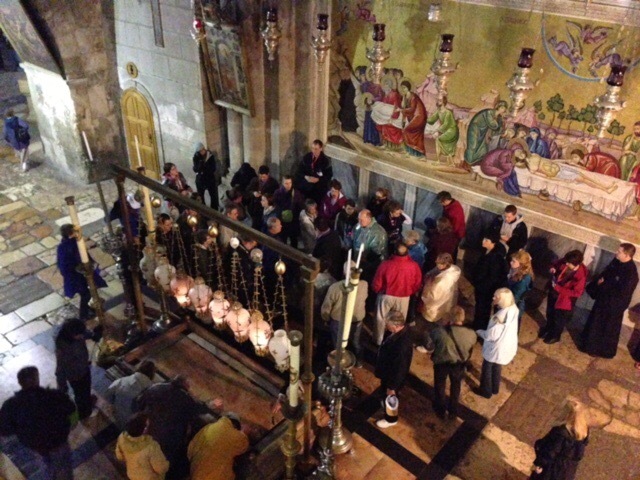 Our group last week at the Holy Sepulchre. BETHLEHEM, September 19, 2014 (Zenit.org) – Here is a statement from the ordinary session of the Assembly of the Catholic Bishops of the Holy Land, which met this week in Bethlehem. Point 5. They reaffirm the Appeal of the Pilgrimage Committee in Jerusalem that pilgrims return without fear to the Holy Land. In fact, the pilgrims’ itinerary was always and is still very secure. Furthermore, pilgrims are a bridge of peace in this troubled area of the world. See our Safety Video taken a few weeks ago while in the Holy Land below. That is my prayer for all interested pilgrims. It is safe or Steve would not take you. Previous post: If There is No Infallible Teacher, What Good is an Infallible Bible?